LEHIGH VALLEY, Pa., September 26, 2018 – After an unbearably hot and humid summer, it’s finally time for the much-anticipated views, tastes and aromas of fall. As you welcome the change of season, Discover Lehigh Valley®, the destination marketing organization dedicated to promoting tourism in Pennsylvania’s Lehigh and Northampton counties, wants to help you plan your perfect fall getaway and leaf-peeping adventure. According to the Weather Channel, Lehigh Valley should expect peak fall foliage in mid-to-late October, which is the ideal time for an escape to the region. Delaware & Lehigh National Heritage Corridor – A multi-use trail spanning 165 miles and passing through Lehigh Valley, the Delaware & Lehigh National Heritage Corridor was once a historic transportation route intertwining railroads, canals, rivers, and trails. Along with hiking or biking the trail, visitors can take a ride on the 110-passenger Josiah White II canal boat to witness the fall colors. 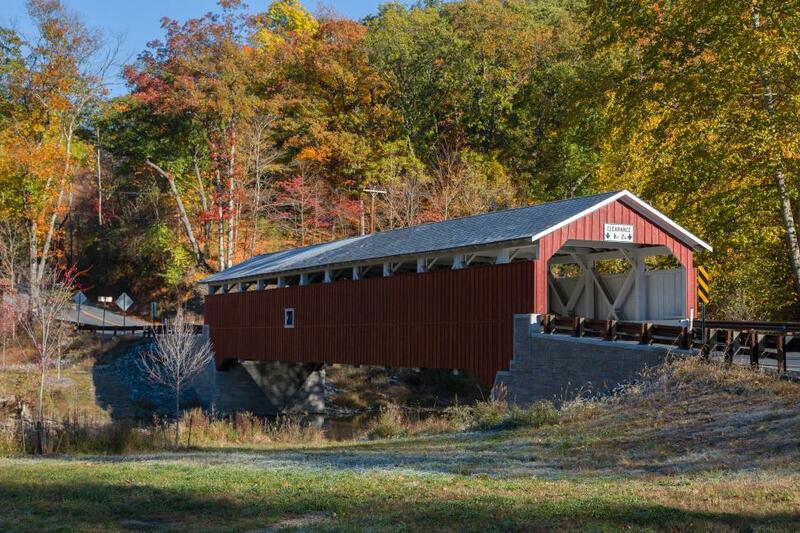 Lehigh Valley Covered Bridge Tour – Home to seven of the more than 200 covered bridges in Pennsylvania, the Lehigh Valley Covered Bridge Tour is approximately 50 miles long and is picturesque, especially on a crisp fall day. Horseback riding at Jacobsburg State Park – With over 18 miles of trails for horseback riding, hiking, and mountain biking, Jacobsburg State Park provides a colorful backdrop of vibrant fall colors for adventure seekers. Chairlift rides at Blue Mountain Resort – A premier outdoor destination, Blue Mountain Resort is home to a variety of thrilling adventures. For a truly unique fall experience, take a scenic lift ride up and down Pennsylvania’s highest vertical at the resort and see rich colors come to life. Colebrookdale Railroad – Deep in the heart of Pennsylvania, Colebrookdale Railroad takes visitors to places were only white-tailed deer, great blue heron and bald eagles roam. A true engineering feat filled with endless stories, the experience includes stunning fall views, intriguing history, and classic family adventures. Celtic Classic (September 28-30, 2018) – An international voice for all things Celtic with its roots firmly planted in historic Bethlehem, Celtic Classic helps preserve and promote Celtic heritage through music, athletics, piping, and dance. When attending, don&apos;t miss the Highland Games, where top athletes from around the world display feats of strength, speed, and skill as they compete for the title of U.S. Champion. Oktoberfest (October 5-7 & October 12-14, 2018) – Located on the iconic SteelStacks campus in Bethlehem, Oktoberfest takes over the city with live polka, rock and party music, authentic German food, a playful dachshund race, ice sculpting, the Yuengling Oktoberfest 5k Run/Walk and so much more! Ottertoberfest (October 13, 2018) – Featuring craft vendors, wine and craft beers, live music and otter-related activities, Ottertoberfest at the Lehigh Valley Zoo brings out the kid in everyone! During the event, families must stop by the interactive exhibits for a chance to tour inside the Kangaroo Walkabout, feed the Lorikeets a cup of tropical nectar, and brush the goats during the Goat Experience. PA Bacon Fest (November 3-4, 2018) – Recognized for its fun and charm by FEST300.com, PA Bacon Fest is one of the world’s best festivals where visitors can enjoy countless bacon-centric culinary creations, cheer on their favorite pig or pooch in the annual Pig and Wiener Dog Races and sample pairings of bacon and beers with Weyerbacher Brewing Company. For more Lehigh Valley fall getaway recommendations, visit DiscoverLehighValley.com/Fall. Follow @LehighValleyPa on Facebook, Instagram, and Twitter.